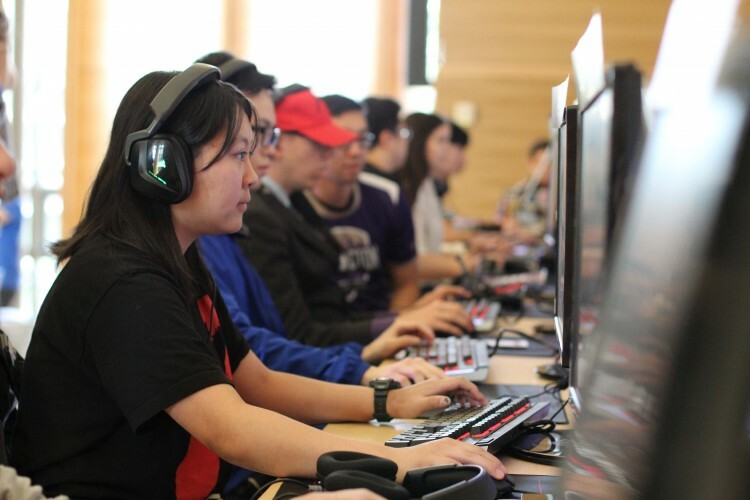 At the time of opening, the UW will be both the largest public, higher education institution in the nation and the first university in the state of Washington to have a dedicated esports arena. The new space will serve a regional community that’s exploding with new games, events and student organizations, Zhou said. Over the span of the planning process, students’ opinions and feedback have been incorporated into every aspect of the Esports Arena & Gaming Lounge, from its overall design to its technology, artwork, games and more. The HUB Board of Representatives, University staff and administrators and Registered Student Organization (RSO) leaders all helped to design the space. Students will have access to 40 high-end gaming computers, as well as two virtual reality systems, a casting station for live streaming to Twitch and popular, unlocked PC games. The Esports Arena & Gaming Lounge will also serve as a dynamic event center for programming, including RSO use and sponsored tournaments. The Esports Arena & Gaming Lounge will focus on three distinct pillars: Community, Career and Competition, said HUB Director Justin Camputaro. “The HUB’s mission mirrors these pillars and it ultimately aligns every step of the way with the space in which it is being built,” says Camputaro. The HUB is committed to providing UW students with an affordable experience. Rates for UW students are $3.50/hour or $30/10hours, UW faculty and staff $4.50/hour or $40/10hours and the general public at $6.00/hour. To support the long-term goals of the program, the HUB Fund for Esports and Gaming will provide private support for RSO programming grants, operations and scholarships for competition, and academic and career development opportunities in the gaming industry. UW continues to seek support and input from UW academic units and industry partners to build a comprehensive, interdisciplinary program focused on student engagement from a social, academic and career perspective. This includes Twitch Student, a Twitch-run program that provides support, knowledge and tools to empower students and give them confidence that they can have their voices heard and contribute to the gaming and esports industries. The iSchool’s GAMER Group and the UW Reality Lab also will provide an academic backstop for the Esports & Gaming Lounge. Students are encouraged to enroll in classes, participate in hands-on research, and attend lectures and workshops. “Esports & Gaming Lounge can serve as an excellent testing ground for some of the latest augmented and virtual reality technology and research produced by the UW Reality Lab – taking the work to a broader UW audience,” says UW Reality Labs Director of Research and Education Aditya Sankar. The HUB Esports Arena & Gaming Lounge is a full-service gaming center supporting casual and competitive gaming for the UW community. It serves as the nerve-center and nexus between student communities, business communities, and gaming culture. For more information, contact Adam Serafin at aserafin@uw.edu or 206-616-4890.